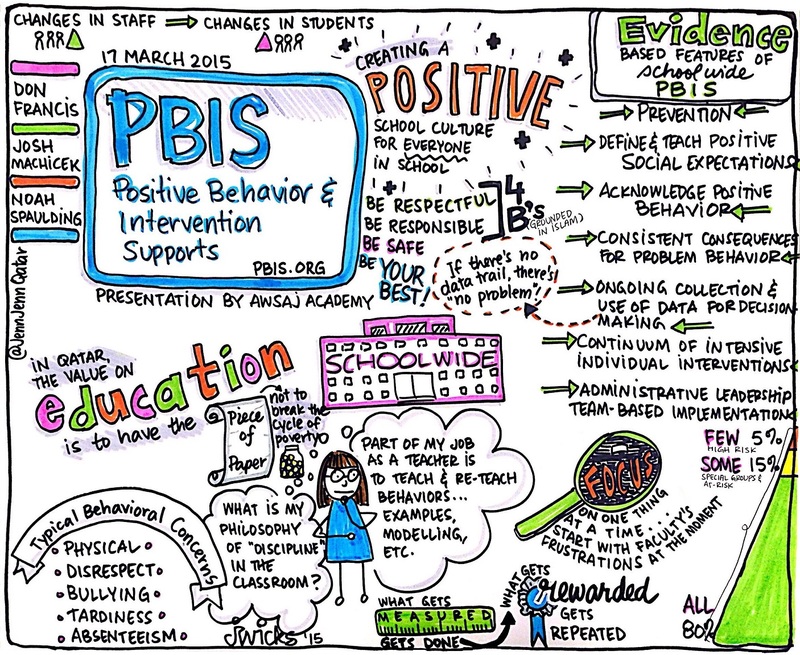 Attended this session today at work to learn about PBIS, and happened to grab a random bag of markers at the last second. I didn’t have exactly the colours I wanted, and didn’t really have a plan at the outset, so it’s not my favourite sketchnote, but I’m definitely glad I took notes! Great to hear what’s been done at Awsaj and the ongoing learning curve with regard to this approach. It’s interesting to view the data that’s been collected over the past 3 years and to see what has worked, what is changing, etc. Can’t wait to have more discussions about this! I had the opportunity to support the students in the Health Sciences Professionals’ Club last night, along with facilitators Cindy and Irene. 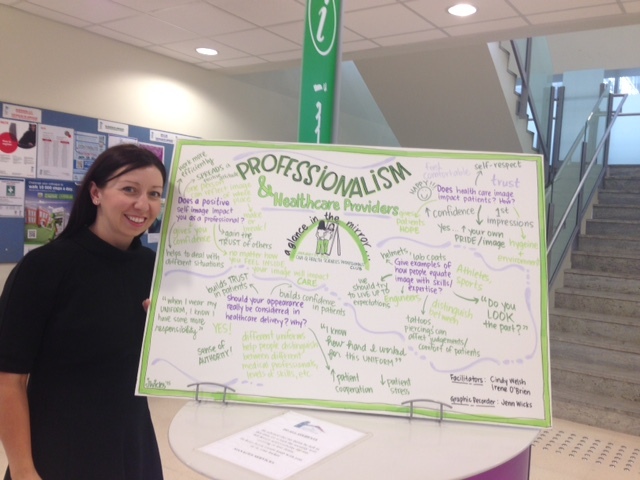 They had a great discussion about professionalism and appearance in their respective healthcare disciplines. It was a lively discussion, and it was inspiring to see so many students come out to learn more about the nuances of their chosen career paths! 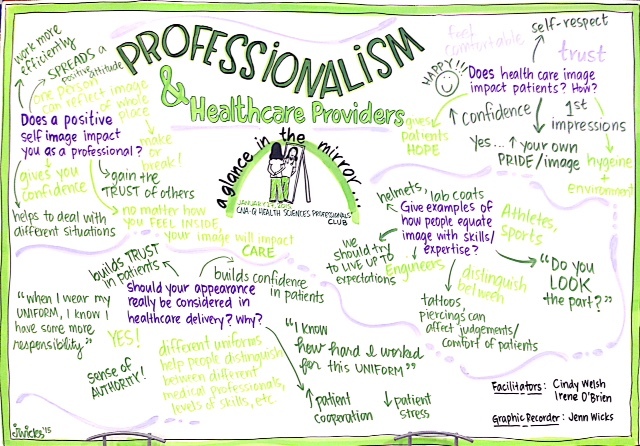 Graphic recording of a discussion about professionalism in healthcare. 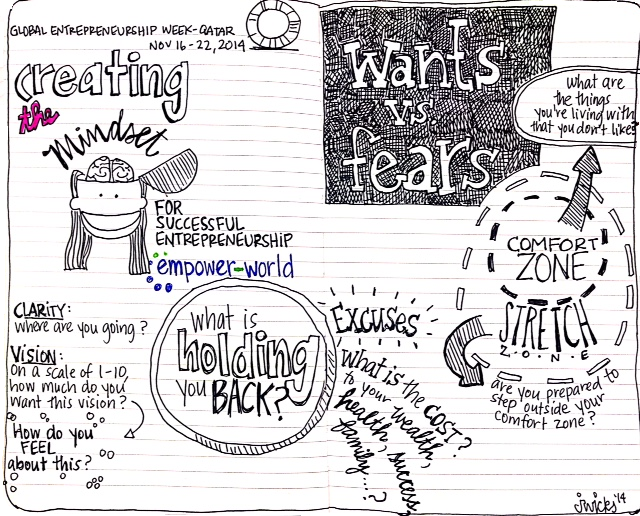 I had the opportunity to attend the workshop “Creating the Mindset for Successful Entrepreneurship” with Empower-World’s Marie Quigley and Jeanine Bailey this week. What a great session and a nice group! I had intended to sketch from the back of the room, but ended up participating. It was tricky to find time to sketch without appearing rude. The number of participants grew throughout the session, but at the start, there were only a few of us, so I decided it would be best to participate. I’m glad I did since it was quite an interesting and fruitful session. I got to think about my own ideas for starting my own business, and explore some of my fears and excuses surrounding these vague plans. Marie and Jeanine are pros and their facilitation from one section to the next was seamless. I was delighted to have the opportunity to sketch this panel as I have been keen to meet the moderator – Qatari cartoonist Abdulaziz Yousef. I am also interested in the topic of entrepreneurship and Qatari youth, so I didn’t want to miss this session at QITCOM. Coming directly from the Jim McKelvey talk and being so happy with my bravery at sketching a more realistic person, I decided to try to sketch Abdulaziz – this was a little more intimidating given his artistic prowess, but I gave it a whirl. Abdulaziz commented in response to my sketch on Twitter: “@JennJennQatar thank you for the more handsome me :p” which I took as a compliment! I also attempted to sketch the rest of the panel, but perhaps to the detriment of capturing more content. Speaking of the content of this discussion, the other attendees I spoke with agreed that this panel discussion was a missed opportunity. It was surface-level without any real debate or stimulating consideration of the topic. I felt that Fouad Mrad’s contributions had the potential to open more critical discussion, but as with many public discussions in Qatar, speakers are often hesitant to speak freely about issues that may be construed as controversial or critical. This is unfortunate because at least one audience member tried to ask a critical question about the impact of religious traditions on entrepreneurship, but aside from a few short statements from Mrad, the conversation was cut short. Mrad assured the audience member that his question was well-taken and that this forum was indeed a venue for critical thought and debate, but the discussion ended there. My notes are revealing in this sense – you can see how sparse they are given that there were 4 panelists and audience questions. Compare this sketch to the previous plenaries, and there is an obvious difference between what I was able to capture. Even considering that I spent a little more time on sketching the panelists, this sketch is a fairly accurate representation of how little there was in the way of “take-away” from this panel. There were, of course, personal examples and other details that I missed, but what was the big picture? This is not to take away from the contributions of the panelists. Each of the panelists had an interesting story to tell, and perhaps with more time and a little more encouragement (a smaller venue perhaps? ), they might have been able to engage in more frank and critical discussion about pertinent issues related to promoting a culture of entrepreneurship in Qatar. I look forward to future events such as this one where such discussions might evolve and provide even more inspiration and food for thought. Jim McKelvey’s engaging talk on the 6 Golden Truths in business was the inspiration for this sketchnote. The co-founder of Square was down-to-Earth, lively, and told a great story. His message was clear and simple, and the organization of his talk was apparent in my notes. I rarely try to sketch speakers in a realistic manner, but for some reason, I did it for Jim’s talk and I was quite happy with the outcome. Unfortunately, I couldn’t quite capture Rishi – the speaker who followed Jim (he is bald and there’s just nothing to hide behind…no glasses, no beard, etc. ), so there is an empty space next to his name. I also missed the beginning slide of Rishi’s talk, so my notes are missing some key information at the beginning. I realize that I’ve been doing mostly live graphic recordings rather than sketchnotes these days, so I’m a little rusty. I had intended to draw individual table cards for each of the 8 guidelines for participants in the world cafe. However, due to time constraints and other preparation for the session, I ended up taking the whiteboard from my office wall on which I had sketched the principles as part of my preparations. I am generally not that comfortable with sharing my whiteboard sketches – I haven’t mastered the format and find I have less control with the whiteboard markers. I always thought whiteboard sketching would be easier because you can erase your mistakes so easily, but I never know where to rest my hand, and find it hard to control the markers with just a pinky finger holding my hand/arm steady. Anyhow, I think this sketch had the desired effect of providing basic information, and will provide a starting point for me when I finally get around to inking the guidelines for real. This is the “title” graphic for a World Cafe I graphically recorded yesterday with a group from Health Sciences at CNA-Q. The World Cafe was just one part of a larger study on a high-functioning team at the college. This was first time trying out foam core board and now I don’t know how I can go back to paper! I’m happily working through Module 2 of the Rockstar Scribe course now. I just love having the paper up on the wall and the mess of the apartment with all my markers and supplies! It’s much more inspiring than starting with a clean place and having to set up from scratch. This image is my “Cityscape” practice. Peter’s lesson on quick shading was fun, and after practicing on some squares, I was able to whip this one up in about a minute or two! It’s not at all accurate, but the iconic Tornado Tower made it in, as well as the Burj Qatar (the spaceship-looking one with the circles). I also included a tower that was inspired by the towers at the Pearl, and I forgot all about the pyramid-shaped Sheraton which I know is a total faux-pas since that was the original solitary structure in West Bay not so long ago, apparently. Oops – will have to add that to my next Doha sketch! I started the Rockstar Scribe course today and this was the product. The assignment was to introduce yourself to the class by representing responses to guiding questions about your life, preferences, and goals. I took some time to do this – about 2 hours in total, so it’s far more than I would spend on a typical real-time sketchnote, and because I had time to sit and plan and ponder, I think the outcome is better than most of my real-time sketchnotes/recordings. Or maybe I’m just improving? I was thinking a lot about my learning trajectory for graphic recording/scribing today as I was outlining my goals for this course. I know I haven’t hit my 10,000 hours yet, which is what it’s supposed to take for you to be adept at a skill. So, I’ll continue chipping away at it, and hope to see some marked improvements over the next few weeks/months as I work through this course and consider the various techniques and tools presented throughout. To me, the feedback is really one of the most important pieces of the puzzle other than practice and application. I want to learn from people who’ve done their 10,000 hours (or whatever that means in other terms of reference). That’s what I’m looking for most from this course and from sharing all of the work that I share in my various learning networks.